“It’s time to hold these climate deadbeats accountable,” said Greenpeace’s climate liability campaigner Naomi Ages, after the suits were announced this week. While communities bordering the Atlantic have been battered by record-breaking storms—which scientists say were intensified by climate change—massive wildfires have ravaged the northwestern United States in recent weeks. 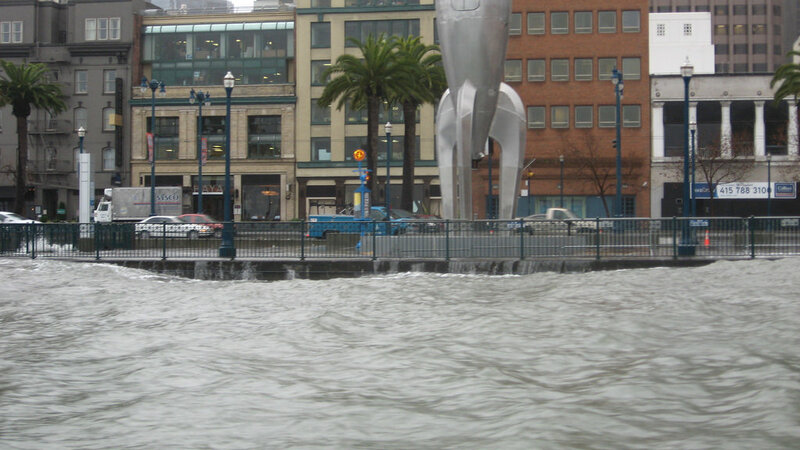 Meanwhile, the coastal communities of Oakland and San Francisco are battling increased flooding, coastal erosion, and property damage from rising sea levels and other effects of global warming. The cities’ lawsuits allege—supported by modern climate science—that major oil and natural gas companies contribute substantially to global warming by extracting and using fossil fuels, which emit massive quantities of heat-trapping greenhouse gases into the atmosphere, causing ocean waters to warm and ice sheets to melt, and thus, sea levels to rise, endangering coastal communities. Further, the suits allege that these companies—BP, Chevron, ConocoPhillips, ExxonMobil, and Shell—have known for decades that using fossil fuels drives global warming, and yet they not only have continued to do so, but also have intentionally deceived the public regarding the consequences. “Defendants stole a page from the Big Tobacco playbook and sponsored public relations campaigns, either directly or through the American Petroleum Institute or other groups, to deny and discredit the mainstream scientific consensus on global warming, downplay the risks of global warming, and even to launch unfounded attacks on the integrity of leading climate scientists,” the San Francisco suit reads. The cities are seeking billions of dollars in compensation for both past and future damage caused by climate change. They plan to use any money they are awarded through the courts to finance improvements to infrastructure. “The harm to our cities has commenced and will only get worse,” Oakland’s city attorney Barbara Parker told SFGate. “It is appropriate that people are now looking to the courts, instead of legislators, to help hold fossil fuel companies accountable for their contributions to sea level rise and other climate impacts,” Kimmell told the East Bay Times. The suits also follow three similar public nuisance lawsuits filed earlier this year by Marin and San Mateo Counties, and the city of Imperial Beach, in San Diego County.